Who wouldn’t want a rich custard dessert baked in filo pastry and served warm? 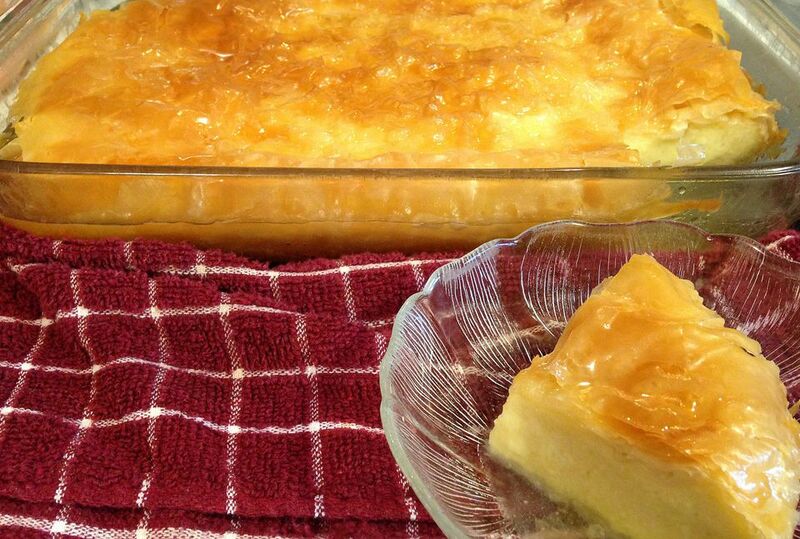 So, please don’t let the long, possibly unpronounceable, name stop you from making this delicious Greek comfort dessert. Perhaps it’ll help to know I pronounce it as: “gah, lock, tah, BOO, tea, co”, which is close to the actual Greek pronunciation. Melt 2 tablespoons of butter and set aside. Separate 6 eggs. Save the egg whites for later. In a large saucepan, whisk the yolks and 6 cups of milk together. Whisk in 1 cup of sugar until as combined. Next, whisk in 1 cup of semolina. Now, place the pot on the stove on medium-low heat. Add the zest of 1 lemon. The pot must be stirred constantly or the custard with start getting lumpy. After cooking and stirring for 15-20 minutes, add the melted butter, 1 teaspoon vanilla and 2 teaspoons of orange blossom water. Whisk it all together and remove the pot from the stove. Melt 1 cup butter. Set aside. If you are new to working with phyllo (filo), it’s best to have a clean and slightly damp dish towel. Place the towel on top of the stack of filo dough to keep it moist while assembling the Galaktoboureko. Use a pastry brush to brush the 10x13 baking pan. You will need two pieces of phyllo to cover the bottom of the pan. Use the pastry brush to splatter the filo with the melted butter. Once you’re done splattering, spread the butter around with the brush. In the interest of working quickly, the filo does not have to be perfectly spread. Once you’re repeated the laying and butter process for at least 5 layers of filo, it’s time to pour in the custard. Fold up the edges of the bottom filo layers. For the top crust, just one piece of filo is required for each layer. Reheat the remaining butter. Pour the butter over the top. The butter should sizzle when poured. Remove the galaktobourko from the oven and pour the hot syrup over it. Allow it to set for about an hour to absorb the hot syrup. It's time to eat. We always serve ours warm, so a quick reheat in the microwave works perfectly. Galaktoboureko is best eaten within a couple of days. You can refrigerate it, but the phyllo doesn't hold up that well. This is my mother-in-law's recipe for this Greek Nut Cake. When people think of Greek desserts, this is the first one most people thinks about. Baklava is made in other countries, like Turkey, too. This is one of my favorite Greek pastries. I love the shredded wheat texture. Looking for a lightly sweet cookie to go with your coffee? This is it.